A new report issued by the U.S. Department of Energy’s Bioenergy Technologies Office (BETO) ranked programs at UC San Diego as the two best in the country for algal biofuels research, including Scripps Institution of Oceanography as top in the nation. An external group of experts from industry, academia, government, and the non-profit sector evaluated 219 projects across nine technology areas representing $1.6 billion of BETO-supported research. 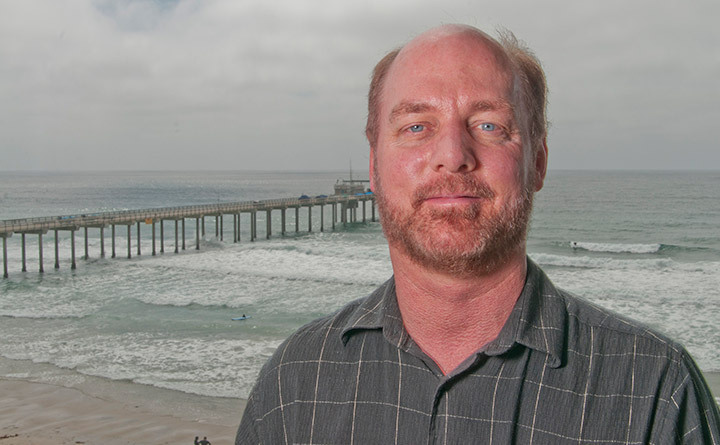 For the 28 Algae Technology Area projects reviewed by the panel, Mark Hildebrand and his team at Scripps Institution of Oceanography at UC San Diego were ranked the highest for criteria that included technical progress, project relevance, and critical success factors. 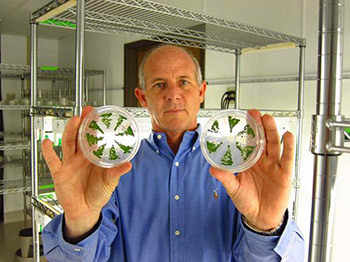 The report specifically cited the lab’s “outstanding research” in the genetic manipulation of algae to improve the yield of key growth components for biofuel production. Coming in second was the UC San Diego Consortium for Algal Biofuels Commercialization (CAB-Comm) led by Stephen Mayfield. Members of the consortium from UC San Diego include Susan Golden, James Golden, Michael Burkart, Steven Briggs, Jonathan Shurin, and Mayfield; Scripps Institution of Oceanography members include Hildebrand, Greg Mitchell, Brian Palenik, and Bianca Brahamsha; Industry collaborators Sapphire Energy and Life Technologies and other academic institutions also participated in the consortium. CAB-Comm was cited for demonstrating how the yield potential of algae can be preserved by controlling pests through development of resistant strains, use of chemical pesticides, and cultivation of consortia of strains. BETO strategically supports bioenergy research that will reduce dependence on foreign oil, promote sustainable energy resources, establish a domestic bioenergy industry, and reduce carbon emissions from energy production and consumption. As described in the BETO report and based on a recent paper in the Proceedings of the National Academy of Sciences (more details), recent Scripps Ph.D. recipient Emily Trentacoste led the development of a genetic technique to target a specific enzyme inside a group of microscopic algae known as diatoms. Trentacoste, working out of Hildebrand’s and Gerwick’s laboratories, developed a technique to metabolically increase lipids, the fat molecules that store energy and can be used for fuel, without compromising the growth of the diatom. (Trentacoste was recently selected to receive a Knauss Marine Policy Fellowship from the California Sea Grant program, during which she will work at the Aquaculture Program Office, part of NOAA’s National Marine Fisheries Service). Separately, Scripps graduate student Cameron Coates led a new report on the biofuel properties of blue-green algae, tiny photosynthetic sea organisms also known as cyanobacteria. Working with Gerwick, a professor in the Scripps Center for Marine Biotechnology and Biomedicine and UC San Diego’s Skaggs School of Pharmacy and Pharmaceutical Sciences, Cameron and his colleagues described for the first time the process and pathways in which cyanobacteria produce fuel compounds known as hydrocarbons. Cyanobacteria are one of only a handful of organisms that are known to directly produce hydrocarbons. Coauthors of the paper, which was published in PLoS ONE, include Sheila Podell, Anton Korobeynikov, Alla Lapidus, Pavel Pevzner, David Sherman, Eric Allen, and Lena Gerwick.